I am always on the lookout for interesting art work … in person or out in the digital universe. Recently, while trying to find examples of engaging artworks for my students to connect to, I came across the work of Michelle Lauriat. 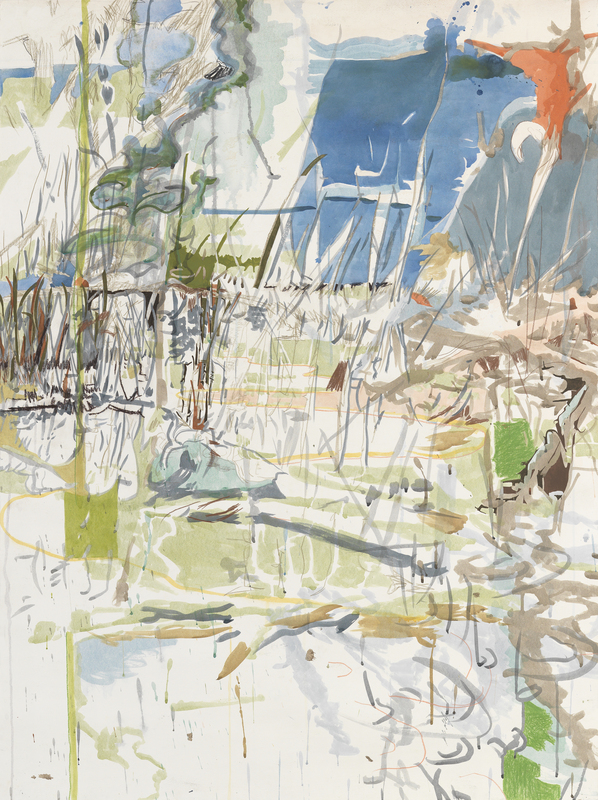 Frankly, I was surprised and so very excited to find her large works combining drawing and painting on paper. I think my pleasure was so intense because she works much as I do in my sketching … but does so on such a larger scale. The work also reminds me just a bit of the image making path that I was on in my early 20’s. So, I feel enthralled by the newness and freshness of her work while also sensing a degree of aesthetic kinship. Ms. Lauriat’s pieces hover between drawing and full-bodied painting; making use of discrete but rich patches of color as well as subtle staining of the surfaces. Using copious amounts of negative space along with fields of color and value, she carefully articulates space/depth and a tentative feeling of solidity. 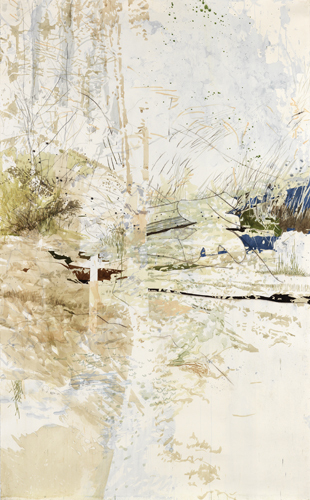 While there is much visible evidence of early exploratory gestural mark making that she has left exposed and even foregrounded, there are also areas that she fills with marks and passages that hint at or describe perceived textures and also bolster the visceral activation of the surface design of her work. I see Lauriat’s working method combining a decisively bold, and at times elegant, editing process with an eye for richly observed and rendered details from the natural world. The results are exquisite combinations of mimetic accuracy and dramatic abstraction. This entry was posted on April 11, 2017 at 10:23 am and is filed under Art & Life, traditional watercolor techniques, Visual Art, Watercolor, watercolor sketching, watercolour, Working as an artist. You can follow any responses to this entry through the RSS 2.0 feed. You can leave a response, or trackback from your own site.